Lovely quality Imperial Gold Aura tumbles. 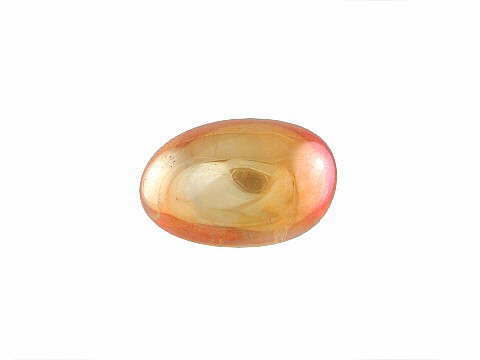 The richly iridescent shades of gold and orange with a hint of pink found in Imperial Gold Aura Quartz (also known as Tangerine Aura and Golden Aura) are very similar to the colour of Imperial Topaz, and their energetic properties are also similar. Imperial Gold Aura is natural Quartz covered with a 1 micron thick coating of Iron and Titanium, giving it this beautiful, vibrant colour. Imperial Gold Aura links the highest traits of the Solar Plexus and Heart chakras. More specifically, it helps merge our will and power of manifestation from the Solar Plexus to our expression of love and emotional connection with the Divine from the Heart chakra. This combination, therefore, enhances our conscious powers of manifestation and co-creation with the Universe; bringing our actions into alignment with the greatest good. It also helps Spirit overcome Ego. In other words, helps guide us to find what is right for us, which is not always what we want, but what our spirit knows we need. It promotes abundance through benevolent thoughts and actions and is a stone of deep compassion, making it the perfect choice for any charitable undertakings. It also resonates with the Sacral chakra, enhancing creativity, balancing emotions and promoting healthy sexuality. It can be an excellent choice for those who experience feelings of being either emotionally numb or over-emotional; bringing the Sacral energy back into balance. Physically it can help energise weak energy systems; those suffering from chronic and debilitating conditions such as M.E. It also links energetically to the heart, lungs, circulatory and digestive systems as well as to the stomach, liver and gall bladder. It resonates with all of the other Aura Quartz crystals plus Golden Labradorite, Imperial Topaz, Siberian Gold Quartz, Moldavite and Danburite. We have 6 of these tumbles available; all of equal quality, but each will differ slightly from the other due to the natural properties of Quartz.